The workshop was held from 20-21 February in Leganes, Spain hosted by UC3M. With the increasing pressure for an evolution of the mobile network, several views have been discussed in the academic, industry, and especially standardization communities. It is now clear that the upcoming 5G network, whose first deployment on carrier grade will start in 2019, will not be a fixed static design, since it will be expected to support a wide range of diverse requirements coming from verticals, service providers, and customers, but it will also entail an evolution path, with some design choices dominant on a first stage, and probably reconsidered in later years. At this point it is also clear that standardisation did not yet cover all capabilities and functionality anticipated to support services in the scope for example of URLLC or mMTC. Starting from capabilities and functionality gaps in latest 5G standards, the workshop aims at providing insight on possible evolutionary paths. The topics for the workshop are open and the experts are invited to present the topic they think are the critical main challenges in realizing the various use cases that 5G promises to solve. In the working workshop, all active elements involved in the design of 5Gnetwork architecture, in order to reflect on the different pros-and cons, have been brought together. A summary of the conclusions will be provided soon. 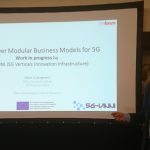 The workshop wasorganized under the auspices of the 5G-VINNI project (https://www.5g-vinni.eu/), a joint undertaking by several telecommunication operators, equipment vendors, research institutes and other organisations. This project has received funding from the European Union’s Horizon 2020 research and innovation programme under grant agreement No 815279. More information about the event is available at the workshop website.